I should start this by saying that this is a week where I would probably pay up for a quarterback. None of the cheaper options are very inspiring. But, if you are looking to go bargain shopping, may I interest you in Ryan Tannehill? Sure the offense isn't overly inspiring, but he is at home against one of the worst defenses in the league. The much publicized "Mackless" pass rush of Oakland should give Tannehill plenty of time in the pocket, and probably gets Kenyan Drake going as well. Add in some DeVante Parker, and he should have a decent week. I doubt he will be the top scoring option during theSundaydocket, but he should put up enough points to keep you competitive. I know he hasn't had a hot start to the season, but this is still one of the better starting running backs in the league, even if his touch totals haven't shown it. With Kenneth Dixon out, expect that to change. Collins will command the majority of the carries and will be the go to on passing downs, meaning he should easily exceed 15 touches in this one. Denver is good against the run but can be spread out, so I smell a couple screen big gainers to boost the totals. Expect a good day. This is a major boom/bust play, as Cohen has been ineffective in the first two games of the season. But the Cardinals defense is awful, and I think Matt Nagy will try and get Cohen going in this one to lighten the load on Jordan Howard and Mitchell Trubisky. That and his big play ability gives him plenty of upside with even a few touches. This is not a safe pick by any means, but could definitely differentiate you if you hit. Playing the Jacksonville wide receivers is pretty risky since Blake Bortles won't be throwing four touchdowns too often, but if you are going to play one, may as well play the most dynamic one. Westbrook captivated with his 61 yard touchdown last week, played 51 snaps, and even got a rushing attempt (don't ask how it went.) The Titans are, in a word, bad, so there is going to be room to work. And again, cheap plays are always risky plays, so at least Westbrook supplies the upside you are looking for in a bargain. 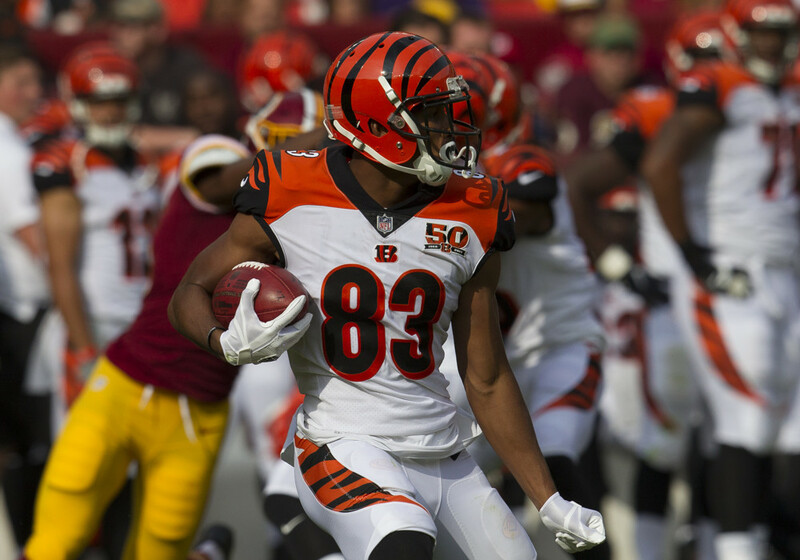 Your deep sleeper of the week is Tyler Boyd of the Cincinnati Bengals. Overshadowed by the more heralded 1st round draft pick John Ross, Tyler Boyd actually received the majority of the preseason practice buzz. Last week, he actually put some numbers to it with a six catch, 91 yard performance. More importantly, he saw 9 targets, a total that matched AJ Green on the night. It's tough to get a number two receiver on a competent office for this cheap, and while the Panthers aren't an ideal matchup, it could be worth stacking your lineup and using Boyd as your speculative play. I have little explanation for this valuation. I understand that Dallas' defense has looked good and that Seattle's offense is bad. I get it. But Dissley already has two red zone targets and the Seahawks love to use the tight end as a receiving threat around the end zone. On top of that, he has the 12th most targets at the position, the fourth most yards, and is tied for the lead in scores. I have no idea why you would pay an extra $1,000 for someone that is going to have the same point total potential. Either go big at the position or pick up Dissly.